Betat Casino – Hot Summer Offers / Week 2! Ready…. Set… Summer! We hope you enjoyed the first week of Betat’s “Hot Summer Offers” and are all geared up for the second week. Starting today, can claim again rewards for Free Spins and cash back prizes practically every day of the week in July. Get your flip-flops and sunshades as it is going to be a hot summer. Ready…. Set… Summer! 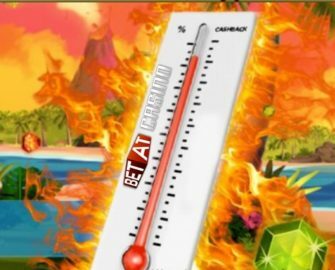 The scorching heat is on and Betat Casino is cranking up the excitement with an awesome Cashback on some of their hottest games. Opt-in to ‘Heat Wave’ now to get a sunny cashback on net losses should Lady Luck not shine on you. A deposit during the week is needed to qualify for this offer. Minimum cashback is £/$/€ 10, maximum is £/$/€ 50, credited on 17th July with a 15x wagering requirement.